Separate, analyze and identify substances in gaseous samples. 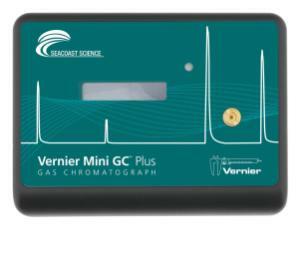 Developed by Seacoast Science, the Mini GC Plus uses an efficient, software-controlled internal pump system. This design allows our Mini GC Plus to use room air as the carrier gas. Use Vernier’s award-winning software for column control, collection, and peak integration with either Logger Pro or the LabQuest App, peak integration analysis and retention-time determination are built right into the software. The maximum temperature of the column is 160°C, offering more flexibility in designing temperature profiles. Standard sensitivity mode works well for polar compounds such as: ketones, alcohols, and esters. High sensitivity mode works well for compounds such as halogenated alkanes and substituted aromatics, as well as mixtures with one or more compound of low concentration. Comes with one high-quality 1µL glass syringe, 2-7/8 inch stainless needle with non-coring beveled tip and needle guard, 1.5 inch injectable length.